Transport your drone gear in one grab-and-go storage solution with this Go Professional Cases Limited Edition Backpack for your DJI Mavic 2 Pro/Zoom drone with accessories. This water-resistant nylon backpack is designed to store your equipment via an interior closed-cell foam insert with precision water jet cutouts. It is designed to fit a DJI Mavic 2 Pro or Zoom, a controller, a 5.5" CrystalSky monitor or smartphone, four spare drone batteries, two monitor batteries, a charger, charging hub, an SD card holder, and various accessories. 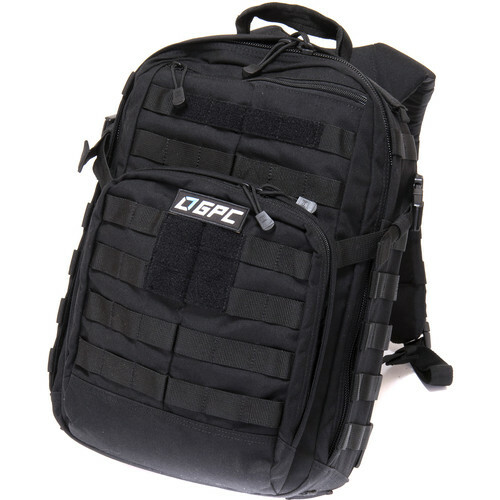 There are four compartments on the backpack exterior for accessories, one interior mesh pocket, and a MOLLE strap system for attaching optional pouches or gear. The backpack and exterior pockets are sealed with YKK zippers. In addition to the ten interior precision-cut compartments, there are four exterior zippered enclosures and one interior zippered mesh pouch. Also, you can utilize the wraparound MOLLE with Slick Stick web platform to attach (optional) compatible modular pouches and components. Constructed from water-resistant 1050D nylon material, the 5.11 RUSH12 tactical backpack is designed to withstand being transported in the elements. Also, the interior closed-cell, low-abrasion foam is made to be water and dust resistant. Box Dimensions (LxWxH) 20.0 x 13.4 x 10.5"
Limited Edition Backpack for DJI Mavic 2 Pro/Zoom is rated 5.0 out of 5 by 2. Rated 5 out of 5 by Jim from Very impressed!! This GPC backpack for my Mavic 2 Zoom totally exceeded my expectations, From the durable fabric, zippers and straps! Plenty of room for all the accessories standard charger, charging hub, extra props, batteries, sd cards and more, a must have if you plan on hiking with your drone for a day or camping overnight. The hydration pocket would help fill that adventure as well. I am seriously considering getting a other GPC bag/backpack for a range bag as well !! Rated 5 out of 5 by Peter from Just perfect. On motorcycle and hiking. Easy to pack / unpack. Pockets for every purpose and more.